Alfred Folkes was born in Broadway, Worcestershire, in early 1887, the son of William Smith Folkes, a glazier's journeyman, and Alice née Parker. William later worked in his family's painting and decorating business. 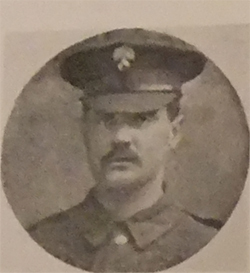 After leaving school Alfred first found work as a general labourer, but later joined the Gloucestershire police and moved away; however, he may have left the police before his enlistment, as he is not recorded on the Gloucestershire Police Roll of Honour. Alfred enlisted fairly early in the war, joining the prestigious Grenadier Guards and arriving in France as part of the 3rd Guards Brigade on 23 October 1915. His battalion would have been engaged in some of the main battles of the Somme and Passchendaele campaigns, which incurred enormous numbers of casualties. It may be during the latter that Alfred was wounded, as he was honourably discharged on 11 September 1917 being no longer fit for military duties and awarded the Silver War Badge. The regimental records confirm that he had served as a guardsman, the equivalent of a private and the rank given in some sources. Alfred returned to Broadway and became a postman. On 3 March 1918 he married Millicent Annie Butler at St Mary's, Frampton, after which the couple lived in the village. Alfred Folkes contracted influenza during the 1918-19 pandemic and he died on 29 October 1918. He was given a military funeral at St Eadburgha's, Broadway, on the following Saturday. Mrs Folkes contributed 5s. to Frampton's war memorial fund, and is believed to have lived in the property known as The Cottage, in The Street, for a short while afterwards. Alfred's war service is also recorded on the plaque in the village hall and on the Broadway war memorial. He was posthumously awarded the 1914-15 Star, British War Medal and Victory Medal.